The Kingdom of Italy was the Italian state from its unification in 1861 to its defeat in WW2 and its dissolution in 1946 when it became the modern day, the Italian Republic. Italian unification process between 1815–1870. Count Camillo Benso di Cavour, the first Prime Minister of the unified Italy. Victor Emmanuel II, the first King of the united Italy. Giuseppe Garibaldi, major military leader during the Italian unification. A factory machinery exposition in Turin, set in 1898, during the period of early industrialisation. National Exhibition of Turin, 1898. Galleria Vittorio Emanuele II in Milan. An architectural work created by Giuseppe Mengoni between 1865 and 1877 and named after the first King of Italy, Victor Emmanuel II. The Triple Alliance in 1913, shown in red. Francesco Crispi promoted the Italian colonialism in Africa in the late 19th century, but the humiliating defeat at Adwa brought about his resignation. Italian mounted infantry in China during the Boxer Rebellion in 1900. 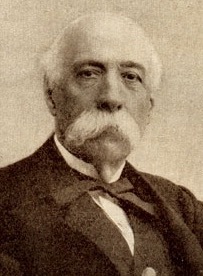 Giovanni Giolitti was Prime Minister of Italy five times between 1892 and 1921. 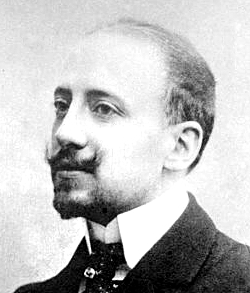 Gabriele d'Annunzio, national poet (vate) of Italy and a prominent nationalist revolutionary who was a supporter of Italy joining action in the First World War. 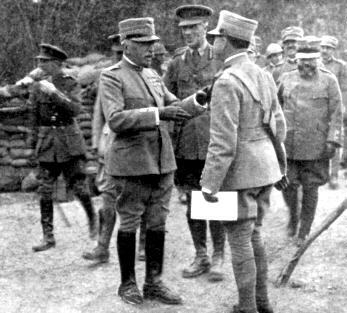 Generalissimo Luigi Cadorna, (the man to the left of two officers to whom he is speaking) while visiting British batteries during World War I. Members of the Arditi corps in 1918. More than 650,000 Italian soldiers lost their lives on the battlefields of World War I.
Italian propaganda dropped over Vienna by Gabriele D'Annunzio in 1918. Map of the Battle of Vittorio Veneto, in which the Italian Army decisively defeated the Austro-Hungarian invader. 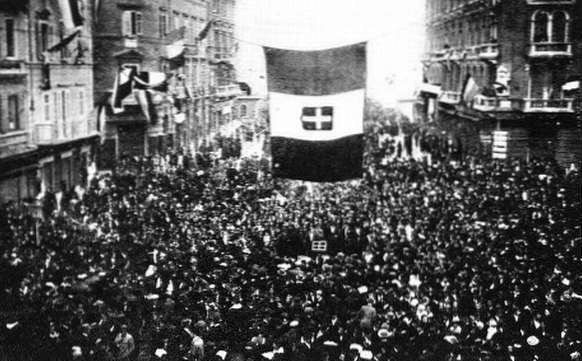 Residents of Fiume cheering D'Annunzio and his Legionari, September 1919. At the time, Fiume had 22,488 (62% of the population) Italians in a total population of 35,839 inhabitants. 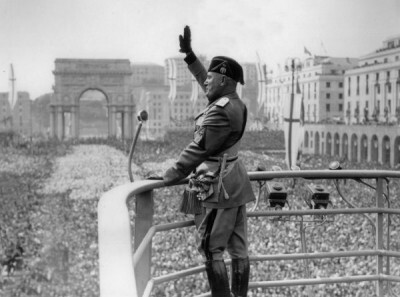 Mussolini was initially a highly popular leader in Italy until Italy's military failures in World War II. 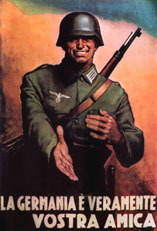 Italian Social Republic poster saying: "Germany is truly your friend"
Umberto II, the last King of Italy. 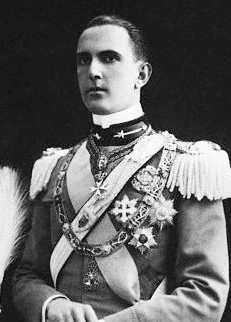 Kingdom of Italy (1861–1946) Facts for Kids. Kiddle Encyclopedia.